The Center for Educational Outreach at the Whiting School of Engineering is pleased to host the Hopkins Robotics Cup, the Championship for Baltimore City Public Schools. All City Schools League VEX teams are invited to participate in this tournament. The event is scheduled for Saturday, January 12th, 2019 at Johns Hopkins University in the Newton H. White, Jr. Athletic Center. You are invited to come watch! Competition starts at 9:00 AM and continues until 3:30 PM, when the award ceremony will announce which teams will continue to the MD State Competitions. 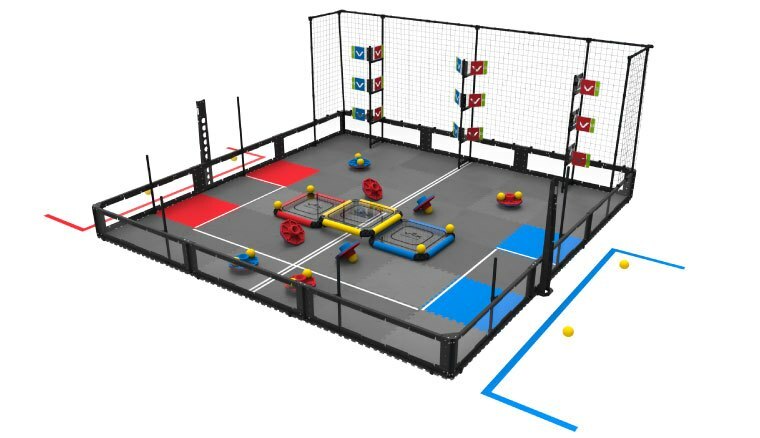 For the 2018-2019 season VEX Robotics has created the Turning Point competition and VEX IQ has the Next Level teamwork challenge for teams to compete in. To see the results of the 2018 VEX competition, click here and go to the Awards tab. To see the results of the 2018 VEX IQ competition, click here and go to the Awards tab. Robotics has been shown to increase interest in STEM studies and careers among middle and high school students. A recent study (Hendricks et. al, 2012) of students participating in VEX Robotics competitions reported over 75% of the students were more interested in taking additional math and science classes in high school or college and 87% were more interested in pursuing a STEM-related career. Baltimore City Schools has created a VEX program to help schools get VEX teams started. Johns Hopkins Center for Educational Outreach has teamed up with City Schools to provide a season-culminating league championship.